© 2012 by Sarah Harris; all rights reserved; content may not be copied, rewritten, or republished without written permission. 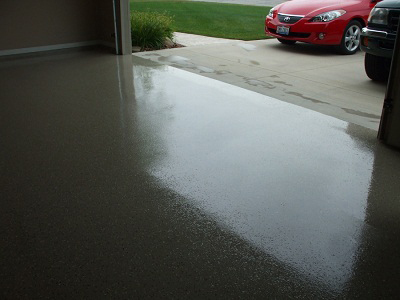 Epoxy coatings in the garage are a great way to keep the surface looking shiny, nice, and now. Its also not too tough of a task for the average weekend warrior homeowner to tackle when work isnt a pressing responsibility. In fact, most epoxy coatings are relatively easy to install, and the most expensive ones wont break the bank by any means. Like polymer flooring, it goes on to provide a seamless surface, an important consideration in areas prone to spills and hard wear. Well talk about some of the best options for an epoxy garage floor coating in your home, and give you some great tips on how to find the coating thats exactly right for you and your needs. How do you want your garage floor to look? This is an important consideration to keep in mind as you get familiar with the different types of epoxy coating, and the look and feel that accompanies each one. Do your research, check out the stores selection, and make sure you find a variety that will provide the appearance you desire. There are colors, textures, and variants of sheen to consider. How often and how heavily do you use your garage? Are youre in there constantly building machines, fixing engine parts, and generally giving the floor a really rough time? Then youre going to want to go with a top-of-the-line 100% two-part epoxy coating that will keep your garage floor protected from years to come. If youre not doing much work out there and all the garage exists for is so you can park your nice sports car, well you still might want the more expensive epoxy. But there are definitely less pricey options available. If youre looking for the best epoxy coating to suit your need, then its a really good idea to head to your local Home Depot or Osh hardware store (or a similar location) and ask someone to help you pick out exactly what you need. Getting in front of a live human being is a great way to truly have your needs met. How long you need your garage floor to last and stay super nice will have a huge bearing on your purchase decision. If youre not too concerned about living in your house for the next twenty years, then you obviously dont need to go for broke in terms of your garage floor coating. However, if you do intend to stay settled over the long run, buying a better coating that requires less replacement or refinishing is a better idea. Its always important to figure out how much you can afford to spend on a project, and if you simply dont have the money, then you might need to get a less expensive option and schedule touch-ups in a couple of years. No matter what your choice, the decision between epoxy floor coatings is simply a matter how what your goals are. You can even use a tool like my online estate agent to assess whether or not your project has added any value to your home. What Kind of Carpet is Right for Your Home?